This is a picturesque coastal peninsula with options for many scenarios and various locations for placement of your settlement. I have already placed a gatehouse at the junction with the mainland to stop bears and wolves entering onto the peninsula although if you wish you can open the gate and see if they enter to make life a little more interesting. This is my first map, Hopefully it will work for you, Enjoy! was it your real intention to create this map without any events? 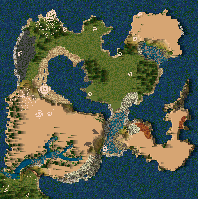 It better fits into the Freebuild-Map-Section!